There may be circumstances when you do not need all the adapters with the focuser. For example, you may be using custom adapters for imaging pruposes only. For this reason we offer the same focuser as described above, but without the 3.5” circular dovetail to 2.7” AP thread, the 2.7” AP thread to 2” compression and the 2” to 1.25” compression adapters. It does include the Drawtube Endcap with the three thumbscrews (S35RFAA). 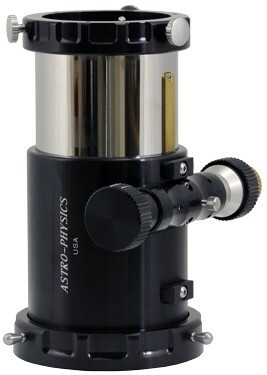 The focuser has 4.5" (115 mm) of travel and weighs 5.8 lbs. (2.62 kg. ).